Alexander Weimann and members of the PBO offer energetic chamber music by J.S. Bach, G.P. Telemann, C.P.E Bach, and Nicola Porpora evoking the caffeinated atmosphere of the Café Zimmermann in 18th century Leipzig. The most successful coffeehouse in town, it provided the backdrop for a series of now legendary public concerts led by J.S. Bach featuring debuts of his own new instrumental works as well as music by many of his favourite composers. Just off the market square, on the most elegant street in Leipzig, step with me under the coloured awnings and through the door into Herr Zimmermann’s café. The smell of brewing coffee is intoxicating, the garden patio is open, and listen! I hear music! In the cosmopolitan trade city of Leipzig, coffee was all the rage. First introduced to the city in 1694, by 1707, the drink was so popular that a Leipzig printer began publishing a magazine dedicated entirely to coffee culture, The New and Curious Coffee House. Some, however, regarded the brew with distrust, denouncing it as a dangerous stimulant and frowning on the emerging café nightlife, as Johann Sebastian Bach’s “Coffee Cantata” amusingly reveals. Women were forbidden from frequenting coffee houses, but were welcome at public concerts, such as those arranged by Gottfried Zimmermann, whose café consequently became a social meeting place for a diverse clientele of men and women, book traders, university students, socialites, and intellectuals. Every Friday evening from 8pm until 10pm, Zimmermann invited the musicians of the Leipzig Collegium Musicum to perform informal concerts in his establishment. Every Wednesday afternoon in summer, they took their music out onto the patio. Admission to the concerts was free, and Zimmermann kept a collection of instruments on the premises for the performers to use, including strings, horns, and a harpsichord. Zimmermann’s idea was an original one, one of the earliest examples of public music-making and concert-going by the middle class – a relaxed venue where music lovers, performers and audience alike, could gather to listen, chat, and enjoy their favourite drink. Georg Philip Telemann founded the Leipzig Collegium Musicum, an ensemble consisting of talented university students and professional musicians, in 1702 while he was a law student at the Leipzig University. At the time, he was also directing the Leipzig Opera, often recruiting instrumentalists from his Collegium Musicum to perform there. When Telemann left, the ensemble was led by successive music directors of the university chapel, but the opera floundered and eventually closed in 1720. The concerts at Zimmermann’s filled this gap in city musical life and gave the students a lively new performance opportunity. Concerts at Zimmermann’s featured a mixture of appealing and progressive instrumental and vocal music, including overtures, concertos, secular cantatas, instrumental sonatas, and harpsichord music. They were an opportunity to explore musical styles and showcase the talents of individual musicians. Bach, for instance, undoubtedly for the use of the Collegium Musicum, subscribed to Telemann’s publications of Paris Quartets, one of which is on today’s programme. Written during Telemann’s visit to Paris for four of France’s greatest musicians, they were some of the most elegant, avant-garde, and cosmopolitan music of the day. Although exact programmes for coffee house concerts do not survive, some manuscript parts for the Collegium Musicum do, many copied by C.P.E. Bach, who also honed his performance skills as harpsichordist and violist in the ensemble and composed his first harpsichord concerto for it. So, it is possible to ascertain that in addition to writing new music, J.S. Bach often recycled and arranged older compositions for the Collegium. Parts copied in Leipzig survive for Bach’s rather mysterious Violin Sonata in E Minor, BWV 1023, an emotionally complex piece that marries the seventeenth-century virtuosic violin playing of musicians like Heinrich Biber with an intense up-to-date harmonic style. Some scholars suggest that BWV 1023 is a reworking of some of Bach’s very earliest chamber music. In addition to his own music, Bach programmed music by his colleagues, including his Bach cousins and the composers on today’s programme, all favourites of amateur music-lovers: his predecessor and friend Telemann, George Frideric Handel, born near Leipzig in Halle, and the widely-traveled Italian composer Nicola Antonio Porpora, teacher of Joseph Haydn. Handel’s solo sonatas, Op. 1, and his trio sonatas, Op. 2, were secretly published by John Walsh under the name of another publisher around 1730, then soon reissued with corrections by Walsh under his own name. No one knows why he engaged in this deception, but perhaps Handel had refused to publish the chamber music, and Walsh wished to force his hand without incurring his wrath, knowing how popular the publications would be. Porpora likely composed his Cello Sonata in F Major while in London, where he founded an opera house in competition with Handel’s. The sonata brings all the drama and lyricism of the opera house into the intimate world of chamber music. Telemann’s Sonata, TWV 40:111 comes from his musical periodical Der Getreue Music-meister, “The Faithful Music Teacher”. It is one of several pieces that he cleverly published with a variety of clefs and key signatures so that it could be performed by different pairs of instruments, depending on what was available. It is delightfully approachable music that the audience members at Zimmerman’s coffee house not only enjoyed listening to but might also have attempted to play in their own homes. What fun to hear a concert, sip a cup of coffee, enjoy a generous slice of German cake, and discuss music and ideas with friends! 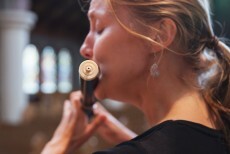 Finnish-born Soile Stratkauskas moved to Victoria, BC, in 2010 and has since established herself as the leading baroque flutist on the Canadian West Coast. She regularly performs at the Victoria Baroque, Pacific Baroque Orchestra, and Pacific Baroque Festival concerts as soloist, chamber, and orchestral musician. Soile completed her undergraduate studies at the Royal Northern College of Music in Manchester, and gained her Master's degree at the Royal Academy of Music in London, UK, where she studied early flutes with Lisa Bezonsiuk. Soile has performed with many prominent period instrument orchestras in the UK, including the Orchestra of the Age of Enlightenment and the Gabrieli Consort and Players, and has toured in Europe with these groups. With her chamber ensemble 'Four Temperaments' she has performed at the London Handel Festival, Saintes Festival in France and Musica Antiqua in Barcelona. Soile is the Founder and Artistic Director of the Victoria Baroque, and is passionate about creating opportunities for music making in the community. She teaches at the University of British Columbia as part of Early Music Vancouver's Baroque Orchestra Mentorship Programme. Beiliang Zhu won the 1st prize and the Audience Award at the 2012 International Bach Competition in Leipzig (Violoncello/Baroque Violoncello). She was the first string player to receive this honor for performance on a baroque instrument. She completed her Master of Music from the Juilliard School in Historical Performance with Phoebe Carrai (Baroque cello) and Sarah Cunningham (Viola da Gamba), her Bachelor of Music and a Performer’s Certificate from the Eastman School of Music. Beiliang is currently pursuing a Doctor of Musical Arts in Violoncello, under the guidance of Steven Doane, as well as a Master of Arts in Ethnomusicology at the Eastman School of Music. Hailed by the New York Times as “particularly exciting”, and by the New Yorker as bringing “telling nuances”, and as being “elegant and sensual, stylishly wild”, Beiliang has given solo recitals at the Bach Festival Leipzig, Boston Early Music Festival, The Vancouver Bach Festival, the Seoul Bach Festival and the Helicon Foundation. She has also performed with internationally acclaimed artists and ensembles, such as William Christie, Masaaki Suzuki, Monica Huggett, Paul O’Dette, the Boston Early Music Festival Orchestra, Juilliard Baroque, the Philadelphia Orchestra and the Trinity Wall Street Orchestra. She won a section cellist position in the Rochester Philharmonic Orchestra while still an undergraduate and continues to hold the principal cellist position of Mercury Houston.